Happiness in the Making: Monday Momfessions: The WWE Version?! Let's just start with this truth, shall we? 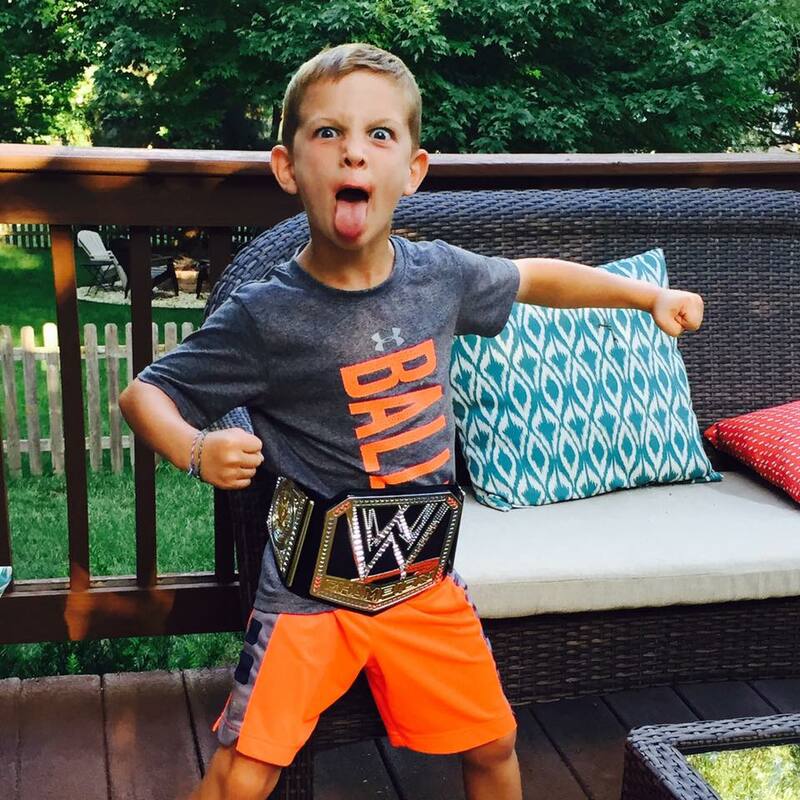 : my kid's obsessed with WWE. That's right, the World Wrestling Entertainment industry. You know, the scantily clad, spray-tanned, faux-fighting situation that now has its own network? Yeah, that one. Le sigh. Don't even ask me how we got here (yes this is the same compliant, always reading, budding artist kid), but here are some of my mom truths related to the shenanigans of it all that run through my head when I'm forced to hear it from other parts of the house. Not even the "mom cave" (aka the laundry room?!) is safe. 1. The hair: listen, under all *that,* you're kind of a good-lookin' dude. Was the blonde streak, length, dripping in oil situation part of the contract or something? Can we have coffee sometime when you rock the new man bun or go short for the summer just so I can check it out? Intrigued. PS: good job on the rest of the manscaping though. 2. What are their sick day policies? Do you still have to go out there and do horrible acting and throw themselves around the ring like a crazy people? I imagine that things like bodily fluids will only add to the drama that is the WWE, so maybe it's just incentivized or something. They straight up played John Cena's broken nose for a good three weeks. Imagine the FLU. 3. Speaking of John Cena: I.just.can't. After seeing the movie "Train Wreck," that boy gets in the ring and I immediately turn red and want to tell my son to look away. But then I'd have to explain why and I think that's a convo for, like, age 15. 4. Why just reigning champion for a year and how is that interesting? I'm half tempted to get one of those "shut up" shirts for Roman but now my kid can read, so that's out. I mean, our children are getting trophies for just showing up. Does the belt really need to be just one man's? 5. How OLD are some of these dudes and HOW did they get started in this career?! Enough said. 6. The girlfriends on the show: lowering all that females have fought for one tanned leg, short skirt and ridiculous comment at a time. 7. Dolph: what are you on man? If it's just 5-hour energy or something, let's talk. If I had 1/25 of that spring in your step, a lot more sh*t would get done around this house. 8. Who lets their young kids watch this stuf....oh wait. 9. Are their "uniforms" the equivalent of "Pink" ensems and do they wash them in between? How many do they HAVE? 10. Because I'm in marketing: cameraman....good angles, dude. You got this. Except on the days you don't and it's all fists 6 inches from faces and falls that happen 4 seconds too late. But hey, taping gymnastics has to at least be as difficult as getting your toddler to smile for one photo. Don't even get me started on the "Total Divas" (wwwwhhhhaaaaa?! ), who even as I'm switching the channel (boys not allowed to watch the hair pulling), have already flabbergasted me on their way out. Or why the announcers are seemingly decent, hot athletes. The crowds. Monologues. And so much more. I don't get it. But I can name any mainstream wrestler you set in front of me, either in person, Mattel or Lego. And I happen to be hosting a WWE party this weekend, plus attending the live event at the Sprint Center in November. I should probably wear my "Boymom: blood, sweat, tears" shirt and bring a flask, yes?! WWE: "women wondering everything." Check it out.